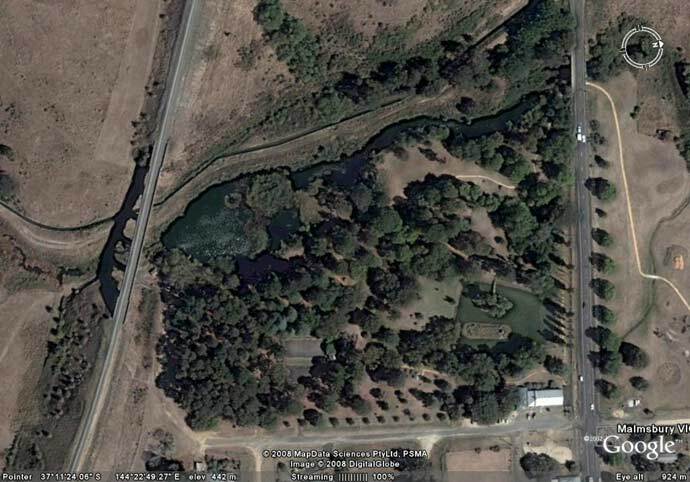 Satellite view of the Malmsbury Botanic Gardens, 2008. The Gardens are bordered by a poplar avenue and Mollison St. (right), Ellesmere Place (bottom), Melbourne-Bendigo railway and viaduct (left) and the Coliban River (top). The Town Hall is in the bottom right corner of the Gardens, with the lake and its islands just above. Also visible are the old bowling green (bare area just below the river) and the disused tennis courts (just left of centre). Google Earth, 2008.